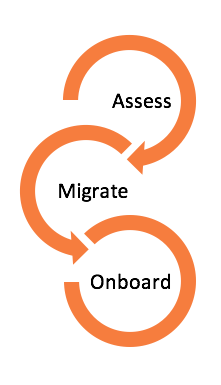 Migrate your files to SharePoint Online with minimal risk and low impact to users. Vorsite utilizes a proven process that vets SharePoint Online with your existing environment, content sources, and future needs. We work with Dropbox, File Servers, SharePoint Sites, Cloud File Shares, etc. The outcome is your organization's content is organized, findable, and moved to Office 365 SharePoint Online. We examine all content sources, current customizations, and identify areas of risk. We understand your current usage and future goals. We map what you have today to what you will want for tomorrow. We move all required content to the new environment. We secure and configure the environment. We provide communications and training for end-users to deliver a smooth transition from your old environment to Office 365 SharePoint Online. Vorsite begins by scheduling an assessment to get an understanding of your environment and determine the best migration option. Ready to learn more?